Washington's party left Fort Le Boeuf early on December 16, arriving back in Williamsburg on January 16, 1754. 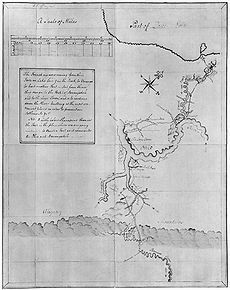 In his report, Washington stated, "The French had swept south", detailing the steps they had taken to fortify the area, and communicating their intention to fortify the confluence of the Allegheny and Monongahela Rivers. On December 12, Washington and his men reached Fort Le Boeuf. Jacques Legardeur de Saint-Pierre, who replaced Marin as commander of the French forces after the latter died on October 29, invited Washington to dine with him that evening. Over dinner, Washington presented Saint-Pierre with the letter from Dinwiddie that demanded an immediate French withdrawal from the Ohio Country. Saint-Pierre was quite civil in his response, saying, "As to the Summons you send me to retire, I do not think myself obliged to obey it." He explained to Washington that France's claim to the region was superior to that of the British, since René-Robert Cavelier, Sieur de La Salle had explored the Ohio Country nearly a century earlier.